A fellow crafter from the midwest was a Novice around my age years earlier but let it lapse; he was still a builder of Heathkits and told me how to get the catalog. I soon contacted the American Radio Relay League which was easy enough because we lived in Wethersfield, the next town. They sent me a official looking (to a 14 year old) white envelope with green triangles on the edges, much as they use now. Inside were pages of test sessions and classes. However, being in school, I opted to buy "Tune in the World with Ham Radio" and do it myself. After receiving the list of examiners near me, I found W1VMY was right in Wethersfield. Paul had been a Navy radioman in World War II; ironically, I later found out that my father's father had been trained in Morse as a Navy radioman in World War II, but hated it so much he begged his way into retraining and the boiler room of a ship ! I soon sent Paul a letter so that I didn't have to disturb him for such trivial matters. Paul contacted my mother directly when he got out of work in Hartford one day, and asked some questions, including whether I was already studying, and advised that she make sure I didn't let my school work get behind as many did. He noted that those who did in the area had subsequently turned into 2 meter repeater flunkies for their ham career, and sometimes had developed no life outside of ham radio because of ham radio ! Now that's politically incorrect these days, but tough. In October 1987, when I knew the information backwards and forwards, I went to a regular VE session at the Red Cross in Farmington, Connecticut. I passed the test with a 100 percent score on both the written and 5 WPM code elements. Before leaving, Paul reminded my parents not to let me get on 10m SSB or 220 FM, noting that I'd never leave and never upgrade if I did. In fact a few months later when I passed the Technician, he reiterated his warning to me directly because by then my parents had bought me an HT for Christmas in preparation for the January test session ! My first QSO as a Novice was on HF and made from W1AW under the eye of W1WPR, who was W1AW's long-time Station Manager. 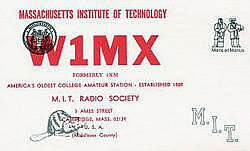 Calling CQ on 80m CW one afternoon at the start of Thanksgiving vacation in 1987, I was lucky enough to be answered by MIT club station W1MX. However, these were the days of the Cold War during the Reagan buildup, and it wasn't long until several hams contacted W1AW asking why W1MX was working W1AW ! My first DX QSO soon followed from home after building my first HF rig, the CW-only, 50 watt solid state, Heathkit HW-99. After I worked a station in New Jersey known only to the ether know, I called CQ and was answered by Taroh Yagi, JH1WIX, on 15 meter CW. As many would point out, he sought me out as he did with many Novice. Although my efforts at Wethersfield High School in Wethersfield, Connecticut, and then Trinity College in Hartford, Connecticut took much of my time, a sudden life threatening heart injury in 1998 left me with more time than a recent college graduate would want. Ham radio filled the void, and became a means to be a true armchair traveller through the pursuit of DX. And DX I did, earning DXCC, WAZ, WAC, WPX, and WAS, on Mixed, CW and Phone modes for all the awards, as well as RTTY in some cases. For what it's worth in my current health, I really do attribute my successes in school in terms of graduating with Honors and Phi Beta Kappa, to the focused studying I developed from my parents and Paul, W1VMY. Both were against distractions of all kinds while studying and WB1ATK reinforced that. There was time for distractions when your studying was over, much like being at work. Distracted work and study are the failure of students and the causes of low productivity of workers today, and why we no longer have a Code test. Most of America is lazy, or distracted. Unfortunately it was a state-documented lazy, distracted doctor who injured me!